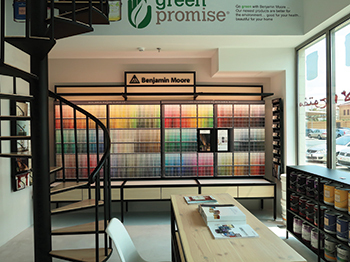 Salwa Amin Interiors’ dedicated showroom for Benjamin Moore paints in Bahrain. Salwa Amin Interiors, which introduced paints from the US-based Benjamin Moore in Bahrain last year, reports that it has received outstanding response to these zero-VOC (volatile organic compounds) products. To promote these products, Salwa Amin Interiors opened a dedicated showroom in Tubli in September 2018. Benjamin Moore Paints, a 130-year-old company is owned by Warren Buffet’s Berkshire Hathaway Company. With the greenest paint offering and over 3,500 hues, it remains the favourite brand amongst designers and professionals across the globe. Its products are highly durable and sustainable, with most of them being zero-VOC. The products qualify for credits for Leed (Leadership in Energy and Environmental Design) V4, CHPS low emitting and VOC emissions. • Commercial, meant for large-scale commercial interior and exterior surfaces and includes Ultra Spec Zero VOC, Super Hide Zero VOC and Coronado. A number of impressive projects in the GCC region have been completed using these products. Owing to the better hide of the products, a coverage of 90 to 95 sq m on a two-coat basis from a five-gallon pail is easy to achieve. This provides material savings of approximately 20 per cent as compared to other brands, says Paracha. • Residential, which includes a number of products each with a differentiated proposition available for end-users and designers. The product range includes Aura, Natura, Regal Select, Aura Bath and Spa, ceiling paint and Advance Waterborne Alkyd, to name a few. This range includes paints and primers, reducing the number of coats to be applied, thus making it time- and money-efficient. These high-quality products can be used on any wall without the use of primer, irrespective of the previous colour, Paracha points out. A key advantage it offers is through the patented colorant system, the “Gennex Color Technology”, which was specifically designed by the company to avoid the use of unnecessary chemicals that often weaken paint. “Benjamin Moore was the first company in the US to introduce a zero-VOC waterborne colorant system to the marketplace by the name of Gennex Color Technology. The innovation of Gennex enables its zero-VOC paints to remain so even after being tinted with Gennex colorants, an impossibility with a generic, all-purpose colorant,” Paracha emphasises. This innovative formula is exclusive to Benjamin Moore products and is the reason why its quality and colour simply cannot be matched or replicated by other brands. The technology allows achieving colour accuracy every time,” he adds. The key strengths of the Gennex colorants include delivering consistent durability in any colour, better fade resistance for improved colour retention, superior hide allowing the job to be done more time efficiently, and zero-VOC for economic responsibility, he adds. Citing an example of durability, Paracha says it has been six years since the exterior of the Shangri-La hotel in Abu Dhabi was painted with Benjamin Moore’s Ultra Spec Exterior and the coating hasn’t shown any signs of fading so far. A few other notable projects include Warner Bros Theme Park and Nation Tower in Abu Dhabi; Atlantis the Palm and Kempinski at Mall of Emirates in Dubai; the new Doha International Airport in Qatar; Four Seasons restaurants in Bahrain; 20/30 Towers and MEA headquarters building in Beirut, Lebanon; and Kempinski Hotel Muscat, Oman, to name a few. Our new product introduction includes the Ultra Spec Scuff-X, which offers cutting-edge performance and protection against scuffs and is ideal for high-traffic environments, such as malls, hospitals, and schools. Paracha says many hotels and schools are now specifying and using Scuff-X in place of conventional acrylic paints. Tuned to the digital age, the company offers the Color Capture app, which, as the name suggests, helps customers to get the exact colour they are looking for. It is available on both iOS and Android. Benjamin Moore Bahrain is technically supported by the regional head office in Dubai. Further product information is available at www.benjaminmoore.com.